Data and statistics can express a point powerfully and succinctly, if used and presented responsibly. The UN offers a vast amount of data on international issues stretching from economic to health and environmental concerns. Take a look at the UN’s own data bank for statistics, UNdata, that searches across offices and resources and offers a rich collection of 60 million records. Numbers by themselves tell us a lot, but place them in relational context, and suddenly, with a quick glance you can compare across regions, at the blink of an eye you can pick up on trends. Gapminder is a cool website that allows you to make your own charts with UN data, so dynamic that you can trace the change of your chart over a specific time frame. 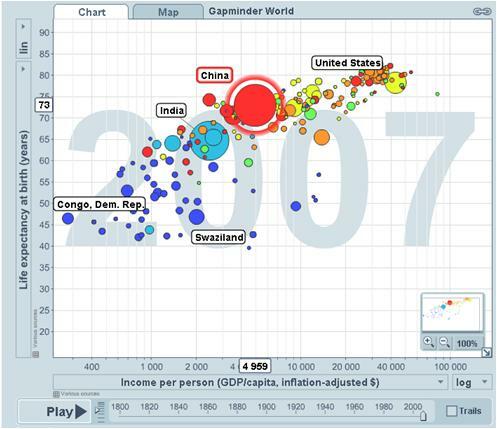 Go into Gapminder world, choose an x- and y- axis from the drop-down menu, and play around. I’ll only warn you that it’s so interesting, you might just get addicted to the data!